Still reeling from her terrifying confrontation with the Magister and her brother’s betrayal, Tessa Gray is drawn ever deeper into the Shadowhunter's dark underworld of demons and danger. In a desperate attempt to help her friends, Tessa tries to uncover the truth about the Magister and learns that he blames the Shadowhunters for the murder of his parents nearly a half century ago. But who were his parents, and why did the Shadowhunters kill them? 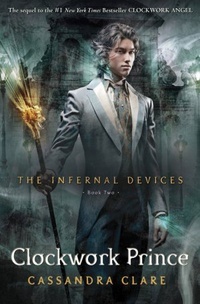 Determined to unravel the secrets of his past, Tessa, Will and Jem journey to mist-shrouded Yorkshire, only to encounter corrupt Shadowhunters more intent on burying the past than finding the Magister - a past that holds the key not only to the enemy's motivations and weakness, but to the secret of what Tessa really is and what she was born to do. Meanwhile, Tessa’s feelings for Jem and Will are growing more complicated, and soon she is forced to acknowledge that any choice she makes will either save the Shadowhunters of London - or end them for ever.